In a classic profile, this rectangular metal wall mirror features a French brass finish and beveled edges. The beauty of simplicity is celebrated with this rectangular mirror design. The French brass finish is contemporary and light. A great choice for use over a bathroom vanity or sink. 22" wide x 33" high x 3/4" deep. Hang weight is 22 lbs. Glass only section is 18 3/4" wide x 29 3/4" high. Surrounding frame is 1 1/2" wide. Rectangular wall mirror from Possini Euro Design®. French brass finish border. Metal construction. Beveled mirror glass. 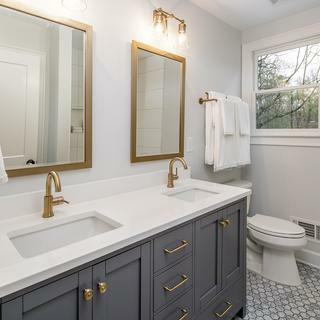 I was looking for something simple and elegant to go with my newly renovated bathroom. 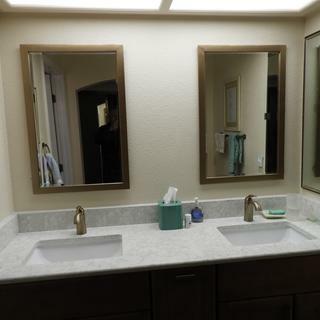 I had purchased Champagne bronze plumbing fixtures and thought this color of mirrors would go well with my fixtures. It will look perfect with the faucets and fixture in my bathroom. doing guess bath in the french brass, hopefully the lights will become available. this would be exquisite. Sizing was an issue for me. This size works perfectly and I like it’s simplistic elegance. Needed something to compliment everything in bathroom. Is it the same gold as the Possine Alicia French Gold? They look very similar. BEST ANSWER: Honestly I am not sure. But I wouldn’t worry about matching. What you want are similar tones. My mirrors are just beautiful. My hardware is polished nickel. My sconces (3) are bronze. My chandelier is aged brass. And it all works very well together. This mirror has a streamlined look which allows it to pair well with many styles. I wish I knew how to attach a photo to show you my bathroom, but I’m not sure how to do that. The color I have is a bronze color. It is attractive and not brassy looking. Will the french brass finish go/blend with the Kohler fixture color vibrant brushed bronze? My faucets are vibrant brushed bronze, my horizontal light fixture is Visual Comfort antique brass and I am looking for a blend. Thank you. BEST ANSWER: The French brass finish will be a bit darker and more gold than your faucets. We have Delta faucets that are champagne bronze. Our Delta faucets are a bit darker and richer than what is on the mirrors, but they work well together. If you are okay with the something a little more in the traditional brass color family to go with your faucets, this would be a great product. The finish is very nice and should go well with most other antiqued brass sort of finishes. Does the french brass match the champagne bronze from delta faucet? BEST ANSWER: Hi Eleonora - Not sure what product you're referring to, but sure, french brass would probably work well together with a champagne bronze color. Yes, perfectly. It looks gorgeous in my bathroom with champagne bronze accent pieces. Yes it is a very close match to the delta champagne bronze. Will this mirror look okay with Possini Midtown burnished brass wall sconces on either side? BEST ANSWER: The Possini Midtown burnished brass will coordinate well with this mirror. 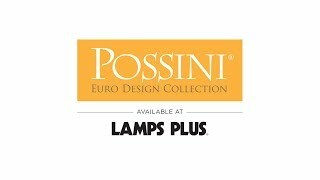 Will the finish of Possini Metzeo Mirror in French Brass match the Possini Euro Elena 21" High Warm Brass Wall Sconce? BEST ANSWER: Yes, they will look very nice together! Can this be hung horizontally as well as vertically? 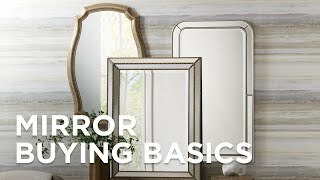 BEST ANSWER: Yes, the mirror can be hung vertically or horizontally. French brass. Is this like silver, gold or what? BEST ANSWER: Hi Judy - French brass is closer to gold than silver. These look absolutely awesome with our Delta faucets in Champagne Bronze. We used these in a design project remodel with brass faucets. They looked great and worked well in the space. The finish has a few slight imperfections - but nothing to worry about. After they were hung they stuck out from the wall a little & seemed a ittle unstable - but the contractor fiddled with them - added felt in a few spots and it worked out well. They looked great with the warm brass of the faucets. We bought three for our bathroom remodels and feel that they are very good quality. 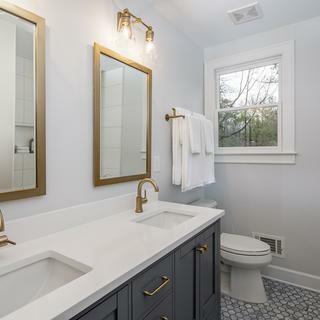 The mirrors are beveled and the frames are a good match for our faucet and drawer pull hardware. They are very well packed for shipping. It matches and goes great with our new Kohler Margaux Faucet. This mirror is beautiful! Wonderful quality! Highly recommend! Though the mirror is nicely finished, it has a rose gold finish that doesnt show up in the photos and isn't well described by the term French Brass. i had to return it. If i had wanted a rose gold mirror it would have been lovely.